Johnny Young (January 1, 1918 ? 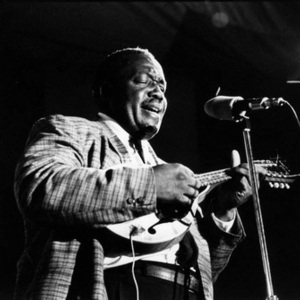 April 18, 1974) was an American blues singer, mandolin player and guitarist, significant as one of the first of the new generation of electric blues artists to record in Chicago after the Second World War, and as one of the few mandolin players to have been active in blues music in the post-war era. His nickname, "Man", came from his use of the mandolin. Young was born in Vicksburg, Mississippi, and played in string bands in Mississippi in the 1930s. He also claimed to have worked with Sleepy John Estes in Tennessee before moving to Chicago in 1940. Young was born in Vicksburg, Mississippi, and played in string bands in Mississippi in the 1930s. He also claimed to have worked with Sleepy John Estes in Tennessee before moving to Chicago in 1940. By 1943 he was working with John Lee "Sonny Boy" Williamson and Muddy Waters and in the late 1940s he became a regular player on Maxwell Street, often with his cousin, guitarist Johnny Williams, as well as playing in clubs with Williams and Little Walter. His first recording was made in 1947 for the Ora Nelle label and featured Young singing "Money Taking Woman" on the A-side, accompanied by Williams, who sang "Worried Man Blues" on the B-side. A second session in late 1948, with Young and Williams joined by Snooky Pryor on harmonica, resulted in a single being released under the name "Man Young" on the Planet label. A further session for the J.O.B. label was unissued, and after a session playing guitar behind Snooky Pryor for Vee-Jay Young retired from performance for a time in the 1950s. The rise of white interest in blues in the early 1960s resulted in Young emerging from retirement in 1963, and he recorded for a number of labels including Vanguard, Testament, Arhoolie and Blue Horizon in the 1960s and early 1970s. Young died in Chicago in 1974 from a heart attack and was buried in Lincoln cemetery, Urbana, Illinois.